Every once in a while, it’s a good idea to remember that the Dunjonquest series existed. 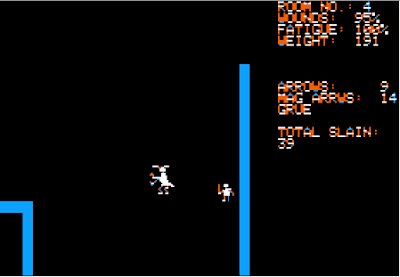 Its first edition, The Temple of Apshai, released in 1979, gets my vote for the first true commercial RPG. Sure, Beneath Apple Manor, Dungeon Campaign, and Space technically preceded it in 1978, but none of them are what we would consider fully-featured RPGs. Temple of Apshai and is paragraph book, full of evocative descriptions of rooms and treasures, was the first earnest attempt to bring the essence of a tabletop RPG module to the computer. Co-creators Jeffrey A. Johnson and Jon Freeman should be names that we invoke as frequently as Richard Garriott or Brian Fargo. 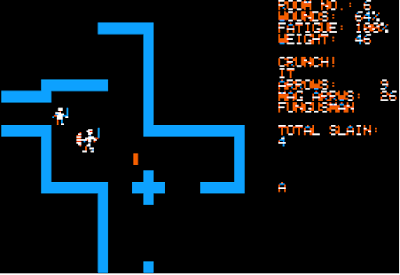 The Temple of Apshai was a huge success, ported to nearly every platform that existed at the time, and it naturally generated a slew of sequels. Oddly, Epyx released several different sets of sequels for the original game. 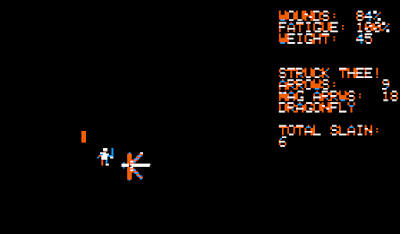 The first set began with Hellfire Warrior (1980; link to my review), which added Levels 5-8 to Temple’s Level 1-3. 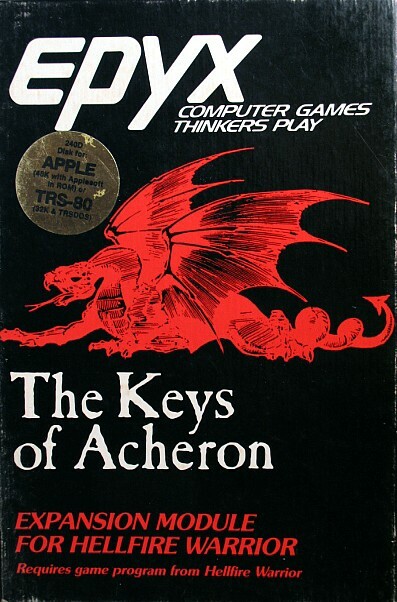 This series continued with The Keys of Acheron (1981) and Danger in Drindisti (1982). 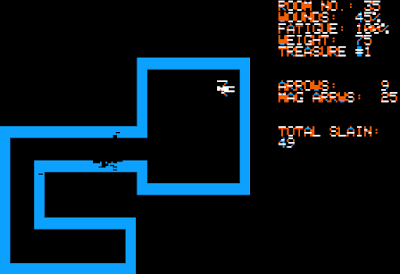 At the same time, Temple continued onto a different set of dungeon levels with Upper Reaches of Apshai (1981) and Curse of Ra (1982). 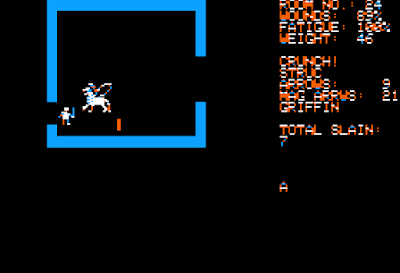 In between these titles, Epyx published a few “microquests” using the Dunjonquest engine but with a fixed character: Morloc’s Tower (1979), The Datestones of Ryn (1979), and Sorcerer of Siva (1981). 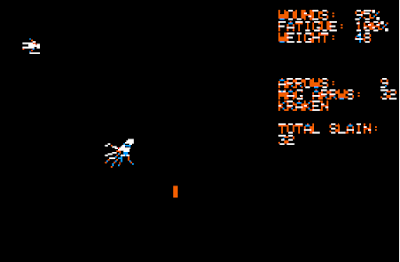 The engine also spun off two horrid action games with no RPG elements: StarQuest: Rescue at Rigel (1980) and Star Warrior (1980). The whole series wrapped up with the terrible Gateway to Apshai (1983), which couldn’t even spell its own name right on the title screen. 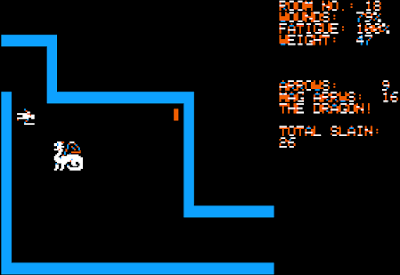 Dunjonquest also inspired a series of simplified diskmag and shareware titles, including Quest 1 (1981), Super Quest (1983), Dungeons, Dragons, and Other Perils (1984), and Cavequest (1985). I bypassed Acheron in 2014, claiming that I couldn’t find it, but I must not have tried very hard because the Azimov archive says that it’s been uploaded there for at least a decade. (And thanks to commenters J.D. and metallik for helping me get it running.) I probably just thought of it as an expansion to Hellfire Warrior, which I’d already covered. But I figure it’s worth taking a second look now, partly to remember the Dunjonquest series, but mostly because it was the first CRPG scenario designed by Paul Reiche III, co-founder of Toys for Bob, and co-creator of, yes, Star Control and Star Control II. 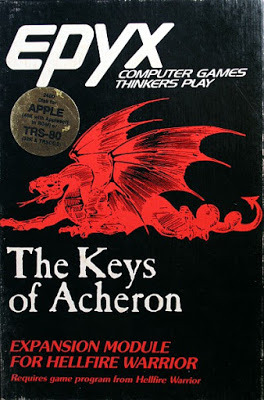 This was Reiche’s first computer game credit after a couple of years designing tabletop Dungeons & Dragons modules for TSR, and his experience can be seen in the quality of the backstory and in-game descriptions. The setup is that the character has been asked by the wizard Abosandrus to recover four magical gems–emerald, amethyst, ruby, and sapphire–from the dungeon. The gems, known as the “Keys of Acheron,” have the power to open or close rifts between worlds, and Abosandrus wants to use them to prevent the immortal demon lord Kronus from invading. 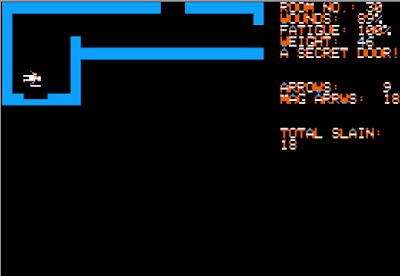 The dungeon takes up four levels, labeled “Abode of the Dragon,” “The Temple in the Jungle,” “The Crystal Caves,” and “The Shadowland of Kronus.” The game does the same weird thing that Hellfire Warrior did where the first and third levels have room numbers (and associated descriptions in the book) but the second and fourth don’t. 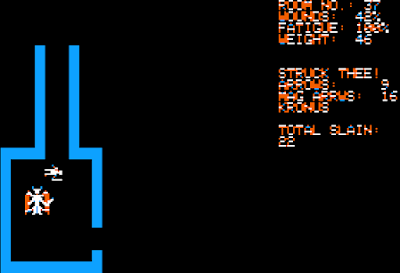 Kronus himself appears randomly throughout the game’s levels and cannot be killed. The game is a bit tricky to get going because it requires the original Hellfire Warrior disk for booting, character creation, and shopping. The Acheron manual tells you bluntly that you’ll screw everything up if you don’t follow its instructions to the letter, and for a while I couldn’t find the instructions. Fortunately, as usual, a helpful commenter came through. In one last screen before you enter, you can donate money to Benedic the Cleric’s mission, which seems to increase the chance that Benedic is the one that finds and resurrects you when you die. Otherwise, you may be found by Lowenthal the Wizard, who takes all magic items that you own before returning you to the town for resurrection; or Olias the Dwarf, who takes all your items; or a random monster, who just eats you. Once inside the dungeon, the game behaves just like the earlier incarnations. You use “R,” “L,” and “V” to turn and rotate the character and then type a number from 1 to 9 indicating how many steps to move in your facing direction. “S” searches for traps, “E” searches for secret doors (you have to be pretty close to the door), and “O” opens them. When monsters appear, you can try to shoot them at a distance with a regular arrow (“F”) or a magic arrow (“M”), or wait until they get close and use “A,” “T,” and “P” for attack, thrust, and parry. When the monsters get your hit points down, you can heal with a salve (“H”), nectar (“N”), or elixir (“Y”) if you’ve purchased them. If the room has a treasure, you grab it with “G.” The controls are all quite intuitive except for movement, which never stops being clunky. You have to be careful about stamina. The game tracks encumbrance (including weapons, armor, and found treasures), and the faster you move with more weight, the faster your stamina depletes. Standing still causes it to (slowly) recharge, and you don’t want to be caught in combat in such situations. I had fewer problems with it here than in the original Hellfire Warrior. With a titanic roar, the corridor fills with the burning flame of the Dragon’s breath. You should have been quieter, more careful. Now it knows you are here. The overall dungeon designs are superior to the earlier games in the series. You start in the “Abode of the Dragon,” a classic dungeon of rooms and passages featuring trolls, ogres, giants, grues, and the titular dragon. These are not Level 1 monsters, so you’re expected to bring an experienced character. The room descriptions have you begin in a field and (depending on the way you go) either enter a tunnel immediately or follow a shoreline around to a cave entrance. They both converge on the dragon’s lair, one via a straight path through monsters and treasures and the other taking a shortcut through a secret door. A side area leads to a unicorn’s grove, where a non-hostile unicorn lets you take an opal necklace. Other treasures found throughout the area include a magic sword and a healing potion; I think this is the first Dunjonquest game where any of the found treasures can remain a permanent part of your character. 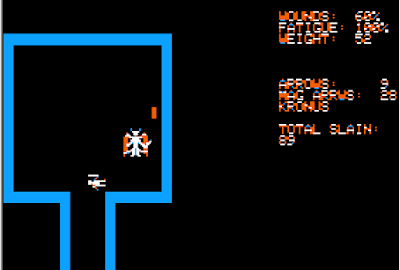 The demon Kronus occasionally pops up in all of the levels, and there’s nothing to do but run away. The manual says that he cannot be killed, and my experience bears that out. The first Key of Acheron, a “spherical ruby gem as large as your fist,” is found beyond the slain dragon. Overall, the level has more valuable treasures than the others, and if you thoroughly explore, by the time you return to the surface, you’ll have enough money to enchant your sword and armor and drink every elixir in the apothecary’s shop before your next trip. “The Temple in the Jungle” offers no room descriptions and simply has you navigating a fairly open level with different types of dinosaurs, giant dragonflies, and Sserpa (snake god) shamans. For the first time in the series, this level has an adventure game-like quality where the “rooms” don’t lie in consistent directions, and the map warps on itself. You have to create a little node map to find your way through. You eventually find the “amethyst key” in a room occupied by a giant tarantula. “The Crystal Caves” puts you in an extinct volcano. There are some interesting “trap” areas that the game suggests are deep pools full of piranhas from which you have to climb your way out. Mechanically, you do this by searching for secret doors, but a player with an imagination will appreciate the game’s attempts to do something clever with limited mechanics. 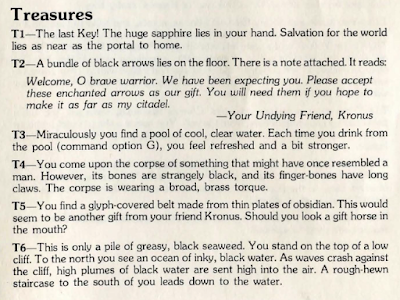 Battling lava beasts, lizards, fungus men, salt slimes and dodging earthquakes and cave-ins (again, all described in detail in the manual), you eventually find your way through secret doors and recover the “emerald key” in a cavern. The last level is called “The Shadowland of Kronus.” Like the jungle, it lacks room descriptions, but here almost none of the treasures are actually treasures. Instead, they generally contain clues or taunts from Kronus. The level takes the longest to explore. Eventually, you find your way through a secret door to a large, open water area, where the game uses a treasure encounter to suggest you’re paddling around on a boat. Waves and “black rain” do damage to the character while you’re attacked by shadow bats, fiends, and krakens. Another node map is necessary to chart a path through the area. A secret door leads from Kronus’s chambers to the final area. You pass through a room of fake sapphire keys (and lots of monsters) before arriving in a room with Kronus himself guarding the real final key. As before, there’s no point in fighting Kronus. You have to dart up, grab the key, find a secret door in the north wall, and escape the dungeon before he kills you. Alas, just like its predecessor, the game is disappointing in its lack of acknowledgement that you’ve completed the main quest. 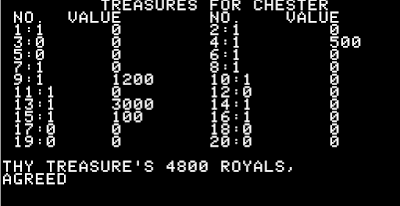 Treasures are ephemeral things; they disappear, converted to gold, the moment the game transitions from the dungeon disk to the program disk. Thus, there isn’t even any way for it to record the fact that you’ve found each of the four keys on their appropriate levels. Even if there was, it wouldn’t matter, because the moment you leave the Acheron dungeon disk, you’re back in the Hellfire Warrior program, which doesn’t even know that Acheron exists. As with so many other places in the Dunjonquest series, you have to use your imagination to return the gems to the wizard Abosandrus and seal Kronus in his own dimension. The appearance of Treasure #1 four times in a row (this is the last) is the only “proof” that I’ve won. The Dunjonquest entries have always evoked tabletop modules, but this is perhaps the most sophisticated of the lot–a testament to Reiche’s prowess as a dungeon master. In a GIMLET, I rated it 24, two points higher than Hellfire Warrior, apparently feeling better about both encounters and the economy. I’ll try to check out Danger in Drindisti in the future. 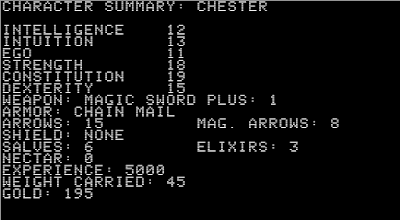 After that, the Dunjonquest series falls apart, perhaps more from the breakup of Automated Simulations (and its rebranding as Epyx) than from anything to do with the quality of the series. If the Dunjonquest series had continued and grown, we might have enjoyed Gold Box-quality games before the Gold Box. I’d like to ask a favor of my U.S. readers. I’m looking for places across the United States that sell Diet Coke with Ginger Lime in 20-ounce bottles. Exactly that–no other flavors, please, and no cans. Just Diet Coke with Ginger Lime in 20-ounce bottles. If you happen to see them at a local convenience store, drug store, or whatever, I would appreciate an e-mail to crpgaddict@gmail.com. Thank you! NEXT POST Next post: The Age of Heroes – A full C64 review by Hayesmaker of Psystronik’s latest release!